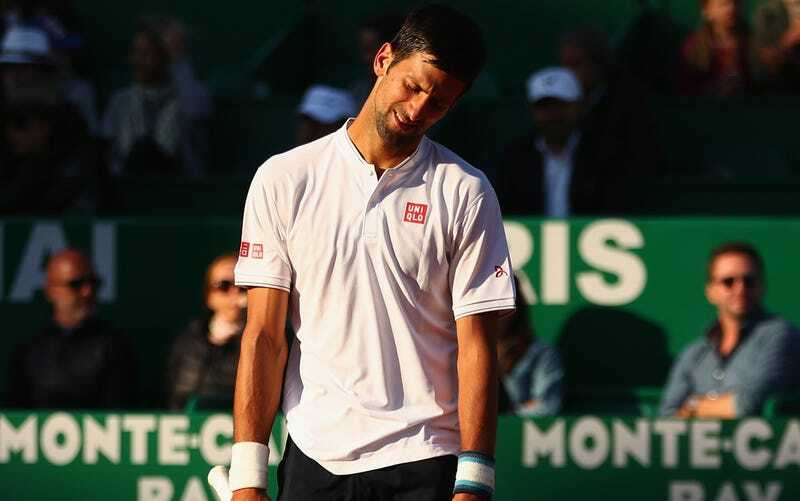 What's Wrong With Novak Djokovic? This time last year, Novak Djokovic was about to complete his fourth consecutive Grand Slam win—as dominant a run as the tour has ever seen. But this year, since the first week of January, he has yet to get further than the quarterfinals of any tournament at all. Djokovic was upset by Sam Querrey in the third round of Wimbledon as well as Juan Martin del Potro in the first round of the Olympics, and lost to Stan Wawrinka in the U.S. Open final. Djokovic vaguely attributed attributed his subpar Wimbledon performance to “private issues” in his life and denied any physical problems. Djokovic withdrew from the China Open, citing an elbow injury. Djokovic discussed extreme mental pressures and said that the top ranking and Grand Slam titles were no longer priorities for him. Djokovic showed up at to the Shanghai Masters and Paris Masters with his coach Boris Becker conspicuously absent. In Shanghai he lost to Roberto Bautista Agut (who he’d beaten in all five of their previous encounters), and in Paris he lost to Marin Cilic (who he’d beaten in all fourteen of their previous encounters). Djokovic surrendered the No. 1 rank to Andy Murray after a hard-fought ATP Finals. Djokovic and his wife Jelena accidentally livestreamed a small dispute on Facebook, in which she accuses of him of being rude for taking the camera without thanking her. Djokovic was targeted by Serbian tabloids, which suggested that he had been unfaithful to Jelena. Djokovic started 2017 by beating Murray at the Qatar Open, but since then has not beaten any player ranked higher than No. 19 in the world. Even his wins have been tough; he’s dropped a set in 11 of his last 15 matches. “I don’t regret things in life ... Maybe I should have had a longer break after Roland Garros, to have more time to recharge emotionally in every aspect of my being. It didn’t happen, I kept on going and I don’t regret it because I believe there was a lesson to be learned from that. Djokovic withdrew from the Miami Open, again citing an elbow injury. Djokovic has lost to Denis Istomin, then ranked No. 117; Nick Kyrgios (twice); and David Goffin, the smaller, weaker version of himself. He had never lost to Istomin or Goffin in his five previous matches versus each. Between his disappointing on-court performance and his curious off-court remarks, there seems to be a story here that no one is telling. If you know or have heard anything, you can email us at tips@deadspin.com, or tip us in an anonymous, secure, and untraceable way with our SecureDrop system.